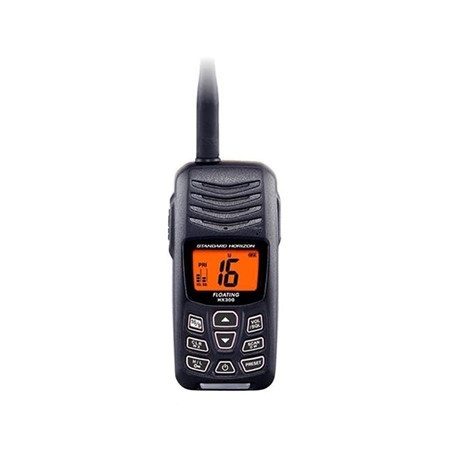 Standard Horizons HX300E Handheld VHF is a compact floating radio which is submersible in 5ft of water for up to 30 minutes. A great little feature is the flashing red LED which automatically activates if you drop it overboard, especially helpful in the dark allowing you to help locate and retrieve the radio. It provides 5W of transmit power and can be charged with a new and unique USB charging cable - no more mains wall-charging or having to purchase an add-on 12v cigarette socket charger. For any technophobes out there, theres no need to panic as the menu system is easy to operate. -Supplied with 1560 mAh 3.7V Li-Ion Battery, AC USB Plug and charging cable. This radio lives in my buoyancy aid (my wife and I have the same type). The buttons do not accidently turn on as happened with the old radio. Getting it damp which frequently happens (sea kayaking) does not seem to set off the emergency light, it does seem to need to be immersed. We have had the first radio well over a year and it works well, holds its charge and seems robust and is easy to use. Very well made and robust just the job for the weekend fisherman and at a good price. Dil was very good got it next day very pleased.